The SIGMA MOUNT CONVERTER MC-21 allows SIGMA SA mount and SIGMA’s CANON EF mount interchangeable lens owners to use their lens investment on L-Mount camera bodies. The converter allows more freedom of choice for L-Mount cameras from SIGMA, Leica Camera and Panasonic, enhancing the extensibility of the L-Mount system. Attaching the MC-21 to your collection of SIGMA SA mount and SIGMA’s CANON EF mount compatible lenses※ allows them to be used as L-Mount system lenses, promoting the effective use of valuable lenses already owned. ※See the list of compatible lenses below. The MC-21 increases the number of interchangeable lenses manufactured by SIGMA that can be used with the L-Mount system by 29 lenses. 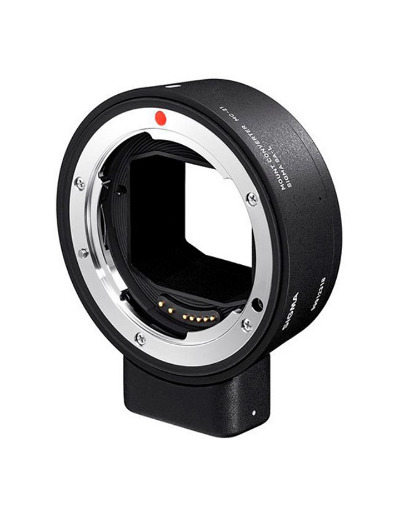 Compatible with the autocrop function, mounting APS-C size image circle DC lenses to a camera body equipped with a 35mm full size sensor still allows immediate use for shooting. High precision AF photography in AF-S mode is achieved. * Not compatible with AF-C mode. Whether the mounted lens is compatible or not is instantly visible from the color and the on/off of the MC-21’s built-in LED. The LED also notifies the user when a lens firmware update is available. Running the data pre-loaded in the MC-21 for each lens by the special control program, autofocus and aperture control have been optimized. Regarding lenses to be released in the future, data for operating these lenses via the MC-21 will be stored in the lens. 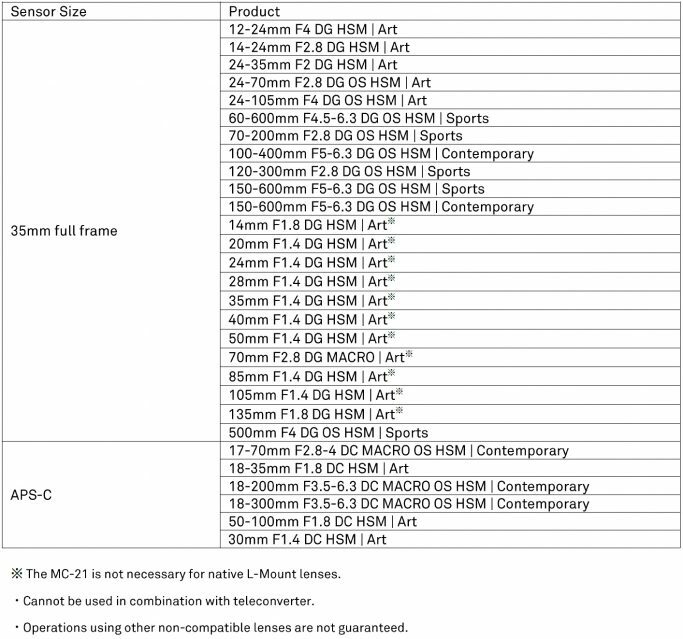 It means no firmware updates of the MC-21 will be required to use those new lenses. In addition, the MC-21 also supports correction functions of camera such as peripheral illumination, chromatic aberration of magnification, and distortion. Equipped with a socket for attaching the tripod※. Lenses not equipped with a tripod socket can be used by mounting the tripod to the MC-21. ※ The tool supplied makes attaching/detaching possible. The inside surface of the barrel is covered with flocking to eliminate internal reflections. To prevent a reduction in lens performance due to internal reflections, the inside surface of the barrel is covered with flocking. Information such as lens type, focal length, F number, and other tags are embedded as Exif data in each image file.